Well this is my story of my first car, or should I say cars. You will soon understand why I say cars. It’s the middle of September, 1988 and I had just passed my drivers license test. So as any teenage boy would be I was hot to buy my own car. I had worked for two summers and also after school to save up enough money to buy a car. Not any car, but a Chevrolet Camaro. And it had to be black! Well it was now going on 7:00pm ( and dark) and a deal was struck. I was now on my way home to show everyone my Camaro. The Camaro drove pretty well and I was impressed. Now the next morning my two older sisters wanted to go for a ride so my dad volunteered to sit in the back seat. Upon putting his foot on the rear floor his foot went right through the carpet and down to the ground. He went into a cursing rage about what pile of junk this Camaro is. Over the next two weeks the charging system died. The brakes failed. The radio died. 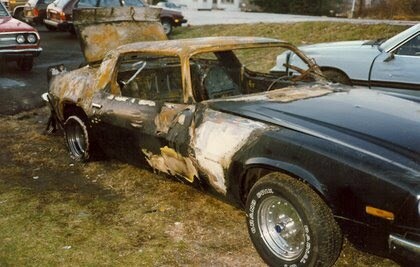 And on the way home form work one night on Interstate 95 in West Chester, PA the car caught fire! Yes Fire! I smelled smoke and pulled over and by this time the dash was on fire. I jumped out and cars started stopping and a least three motorist and two truck drivers dumped five fire extinguishers onto the blaze with no luck. It took a full Tanker fire truck to put this baby out! So my grandmother decided to help me out with a little more money so a week later I could buy a really nice 1969 Camaro and as they say the rest is history. 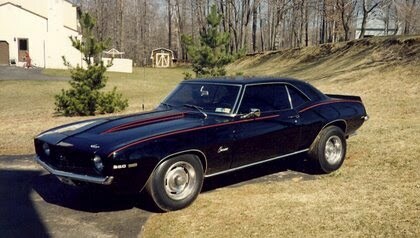 The 1969 Camaro really got me into the antique car hobby and I have been loving it ever since. 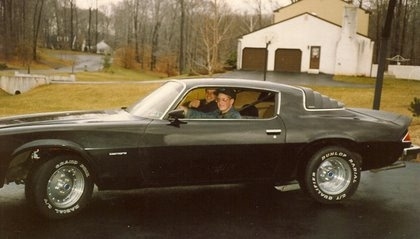 My 1969 Camaro a month after my first Camaro had been purchased and burned.